Kelly Arison, daughter of Carnival Corporation chairman Micky Arison, will christen Carnival Cruise Line’s new Carnival Sunrise when she enters services in New York on 23 May 2019. 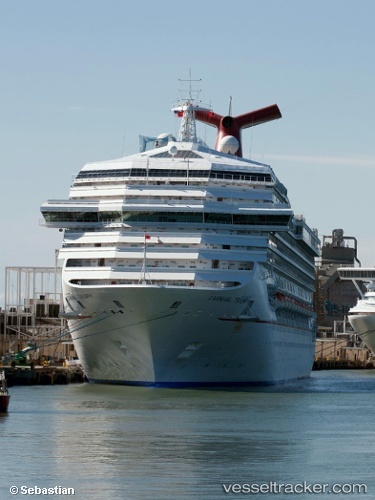 Formerly Carnival Triumph, the new Carnival Sunrise is currently undergoing a US$200 million bow-to-stern revitalisation in Cadiz, Spain as part of Carnival’s multibillion-dollar ship enhancement programme. Once complete, the vessel will offer all of Carnival’s popular branded food, beverage and entertainment innovations, as well as new guest accommodation. The invitation-only naming ceremony will take place onboard Carnival Sunrise, which will be berthed at Manhattan Cruise Passenger Terminal. Kelly Arison will take on the same godmother role previously held by her mother Madeline Arison when the ship first entered service as Carnival Triumph in 1999.